How Did Evolution Running Come About? Athletes in every sport except running devote enormous attention to perfecting even minute details of the movements they will be required to produce in competition. Tennis players spend hours every day hitting thousands of forehands, backhands, serves, and volleys. Coaches supervise and teach, making constant adjustments in technique to create movements that are quicker, more efficient, more powerful, and biomehanically correct. Basketball coaches teach fundamental movement patterns for shooting, passing, boxing-out, and playing defense. Swim coaches have their athletes perform hours of drills designed to incorporate efficient movements into their swimmers' strokes. Running coaches just tell their athletes to run longer and harder. Runners, and their coaches, have basically ignored technique for years, assuming that their "natural stride" will give them efficiency and injury resistance. We have found that this simply is not the case. Imagine a tennis coach handing a student a racket and saying, "Hold it however feels natural. Stand however you want. When the ball comes over the net, hit it back over. If you want to get better, hit more forehands and backhands in practice and hit them harder. Whatever you do, don't alter your natural strokes." One great thing about technology is that machines do not have opinions, they do not lie, and they are not afraid to break with traditions. I have personally performed over 6,000 VO2 Max tests, which measure both an athlete's fitness and his efficiency. One thing that has surprised me is that performance differences between runners are consistently due to economy more than to fitness. Faster runners are more fit, but efficiency plays a greater role in sustained fast running than fitness does. Economy, in the purest sense, is defined as the volume of oxygen consumed at a submaximal running pace. What this means basically is that an economical runner uses less energy to run a certain speed. Economy is not a basically inherent talent, such as high-level aerobic capacity, but can be significantly improved. Any runner who wants to improve should make the effort to learn about correct biomechanics and implement them into his stride. We have found, from beginner to professional, improvements are much easier to achieve through increasing economy. Every runner has genetic limits and most train hard to increase fitness and perform to their potential. They train hard, yet ignore the greatest untapped source of improvement. Many runners, and even coaches, assume that injuries are an inherent part of running. They believe that if you run with enough volume and intensity to stimulate increases in strength and endurance, sooner or later you will suffer from serious injury. I passionately disagree with this philosophy! One common denominator of almost all great endurance performances is a long period of uninterrupted training. Even small injuries can be incredibly disruptive to a training regimen. They should never be tolerated as normal! I believe strongly that adjusting technique can reduce the frequency and severity of injuries dramatically. By minimizing impact stress, maximizing shock absorption, and distributing the remaining stress optimally, injuries can become rarities. By minimizing vertical displacement and landing with your foot correctly oriented and in the right position relative to your center-of-mass, impact stress can be drastically reduced. 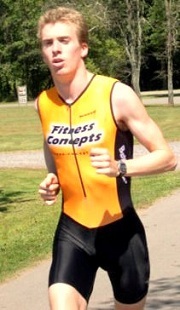 A runner moving his center-of-mass up and down during running not only wastes energy, but also causes injuries. The higher the center-of-mass travels during the flight phase, the more velocity it will gain during descent and the greater the impact stress will be. Our bodies are designed with built-in shock absorbers. The muscles and connective tissues of the feet and calves are extremely elastic. Most runners bypass this shock absorption by allowing their heels to touch the ground. The heel has almost no shock absorbing capacity. The heel is made of bone, which is not elastic. Bone transfers shock very well, and injuries to the ankle, shin, knees, hips, and lower back result. None of these tissues is designed to absorb impact stress, and the resulting trauma eventually creates an injury. For the past decade, African runners have dominated distance running at its highest levels. Research on what makes these runners faster consistently demonstrates normal VO2 Max and lactate threshold levels for elite runners. Their height, weight, and limb-length ratios all fall into the normal category. Clearly and consistently, what sets the great African runners apart is that they are more efficient than their competitors, running faster without expending more energy. Many experts in running economy agree that running barefoot through childhood contributes significantly to the extraordinary economy of these athletes. I'm not suggesting that you run barefoot. I am suggesting that you take the time and effort to learn the techniques that may be more natural running barefoot, and implement them into your shoe-running technique. When was the last time you heard a runner say he was heading to practice? Never, because runners don't practice, they work out. All of the emphasis is on building strength and endurance and no resources are directed to improving efficiency. Runners who truly want to perform to their potential need to make optimizing technique a high priority in their training. Improving technique will enable any runner to maximize economy and minimize injuries, two major keys to maximizing performance. Runners can find a tremendous amount of esoteric discussion about run technique. "Efficient runners minimize vertical displacement." This is intuitively obvious to any intelligent runner and, indeed, confirmed by volumes of research, but SO WHAT? How does that help a runner, or even an educated coach? How do I do that? TEACH ME !!! Do I put my foot down in a different place? Do I land on a different part of my foot? Do I think differently about how a runner creates propulsion? Do I contract different muscles, or the same muscles with different timing? Do I tilt my head differently? No wonder runners ignore technique and economy! Until now, we haven't known very much and there has been no useful information about how to implement what little we do know. 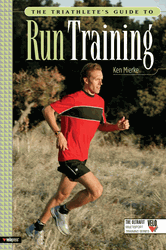 There has not been a single comprehensive resource that has really taught runners how to run efficiently.